In this week's Hit and Run column, Jay Jaffe explores the reasons behind Clayton Kershaw's slide and the chances that potential Hall of Famers Carlos Beltran and Chase Utley will rebound from poor starts. Welcome to the Hit and Run column. The name is a callback to this site’s inaugural baseball blog title as well as my old column at Baseball Prospectus, and the content will allow us to check in on a variety of topics around the majors. In this edition, we explore the struggles by the game's best pitcher, examine two veterans with interesting Cooperstown resumes, take a look at a promising major league debut on tap for Tuesday and more. Coors Field was blanketed by four inches of snow on Sunday, and while the grounds crew was able to clear the field for the 2:10 p.m. local time start, Dodgers ace Clayton Kershaw probably wishes they hadn't. Pitching in 41-degree temperatures in Denver, Kershaw struggled, walking four hitters and allowing four fifth-inning runs, but got a no-decision against the Rockies because Los Angeles' offense bailed him out in a 9–5 win. Even so, the outing was the second time this season that Kershaw has allowed at least five runs, something that happened just once all of last season, during which he posted a 1.77 ERA en route to his fourth straight ERA crown and his third NL Cy Young. Though seven starts, he's carrying a 4.26 ERA, and everybody is wondering what's wrong. Some of it has simply been bad luck. While Kershaw's strikeout and walk rates (30.3% and 6.0% of all plate appearances, respectively) are roughly in line with his 2013–14 combined numbers (28.4% and 5.0%, respectively), he's been undone by homers. He's allowed five already this season, compared to nine last year and 11 in '13, and his 20.8% rate of home runs per fly ball is more than triple his 6.0% from those two seasons. Meanwhile, his .364 batting average on balls in play is 85 points higher than his career mark and 75 points above the Dodgers' pitching staff as a whole. With the slider less effective, hitters have been able to tee off on Kershaw's fastball, hitting .300 and slugging .490 when they put it in play, compared to .254 and .369 last year. It's not clear whether this is a mechanical issue, a physical one, or a matter of Kershaw tipping pitches (a theory floated in the wake of his Division Series meltdown against St. Louis last October), but it does rate as an area of concern, even if the Dodgers are 20–10 and in first place in the NL West. They're already shut down Brandon McCarthy for the year with a torn elbow ligament, and Hyun-jin Ryu is still out with shoulder trouble. Sooner or later, Los Angeles will need its ace to round into form. Sunday was encouraging for two veterans off to starts so miserable that many around the game have wondered if they're done—which, if so, could threaten their chances at reaching the Hall of Fame. In New York, the Yankees' Carlos Beltran hit his first home run of the season in a 6–2 win over the Orioles, while in Philadelphia, Chase Utley hit his first double of the season in a 7–4 loss to the Mets. 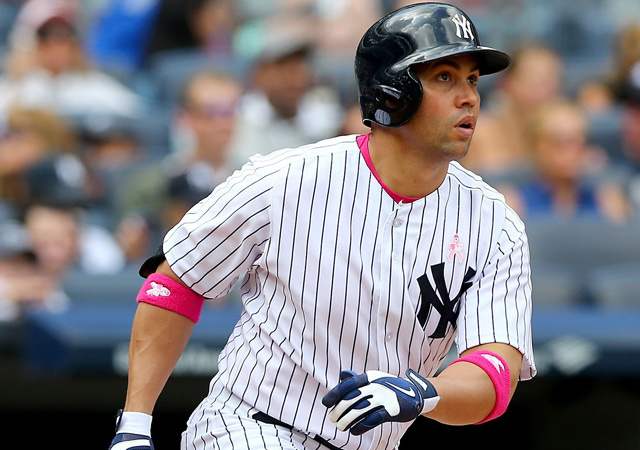 Beltran was dismal last season, the first of his three-year, $45 million deal with the Yankees, though that was due largely to a bone spur and loose bodies in his right elbow. He was expected to improve upon last year’s .233/.301/.402 showing after undergoing surgery at season’s end, but that hasn't translated into a rebound thus far. Beltran hit just .162/.216/.265 through the end of April, going homerless in that month for the first time in his 16-year major league career, and lost playing time in rightfield to hot-hitting Chris Young. ​The 38-year-old switch-hitter has shown signs of turning the corner in the past two weeks, however. He doubled in three straight games from May 1 to 4 and reached base in all four plate appearances on Sunday, including his fourth-inning solo homer off Baltimore's Bud Norris. Beltran is now hitting .297/.333/.486 over his past 11 games with five extra-base hits, lifting his line to .210/.259/.350. That said, he’s still posting a negative WAR (-0.5), his second season in a row below replacement level. While his 66.9 career WAR ranks eighth among centerfielders and his 44.3 peak WAR is a few hairs above that of the average Hall of Fame centerfielder (44.0), his 55.6 JAWS is still short of the Hall standard for the position (57.2). Some may view Beltran as having done enough to justify a spot in Cooperstown on the basis of being a top 10 centerfielder with a stellar .333/.445/.683 postseason line to bolster his other accomplishments (nine All-Star appearances, three Gold Gloves, a Rookie of the Year award). But a weak finish to his career could give voters an excuse to overlook him, particularly if the longstanding ballot logjam doesn't abate. The same is particularly true for the 36-year-old Utley, who ranks 12th in JAWS among second basemen and is still two points below the Hall standard there in terms of JAWS. Utley’s 49.1 WAR peak score ranks eighth among second basemen, well above the average enshrined second baseman (44.4), but his career WAR has fallen to 60.8 due to a dreadful -1.2 mark this year. Utley was benched for two games last week in the midst of what at the time was a 2-for-35 slump across nine games, and after going 0-for-4 in his return on Friday, his batting line dipped to an abysmal .099/.175/.198. He collected a pinch-hit single off Jeurys Familia in the ninth inning of Saturday's game, and even then, Baseball-Reference.com founder Sean Forman noted that Utley's .103 batting average was the lowest for any batting title qualifier through his team's first 30 games since at least 1914, which is as far back as B-Ref's game-by-game data goes. Did Athletics push Parker too hard in recovery from second Tommy John? Sunday's double off the right-centerfield scoreboard marked just the second time this season that Utley has even collected hits in back-to-back games; he has just one multi-hit game, a three-hit performance on April 14. He's now hitting .116/.194/.221 for a 15 OPS+ (yes, 15), a drastic tumble from last year's .270/.339/.407 mark and 3.7 WAR. Obviously, Utley's power has been lacking, but his .101 batting average on balls in play is just baffling. Without any reports of problems with his knees, scouts have wondered if he's having vision problems, while Philadelphia talk radio hosts have brought up the abrupt midseason retirement of Mike Schmidt in 1989. What's perhaps most distressing is that Utley has hit just .227/.300/.341 in 623 plate appearances over the last 365 days, a performance that's harder to write off as a fluke than your typical 3-for-April cold spell, and one that probably dampens any enthusiasm another contending team might have of trading for him as the Phillies rebuild (though he does have full no-trade protection). Given that Utley is in the final guaranteed year of his contract, with a $15 million option that vests if he reaches 500 plate appearances, Philadelphia may need to consider cutting back on his playing time. If he falls short of 500 PA, he has a club option of between $5 million and $11 million whose amount depends upon days spent on the disabled list. From 2011 to '13, Allen Craig was one of the NL's most productive hitters, batting a combined .312/.364/.500 for the Cardinals. Among all hitters with at least 1,000 PA in that span, his 136 OPS+ was virtually tied for 22nd with Beltran, his teammate in St. Louis for the last two of those years. A Lisfranc injury in his left foot, however, hobbled Craig in late 2013 and resurfaced last year, when he hit just .215/.279/.315, numbers that look even uglier considering how badly he's performed since being traded to the Red Sox last July 31. Including this year's 7-for-52 start, Craig is hitting .130/.235/.192 with two home runs in 166 PA, with his May 1 homer against the Yankees representing his only extra-base hit of the season. Craig started just two of Boston’s first 15 games this year, but with Shane Victorino out since April 23 due to a hamstring strain, Hanley Ramirez banged up and Daniel Nava starting even more slowly, he had started eight times and made 39 PA over the team's next 15 games. That hasn't been enough to keep him sharp, and because he still had a minor league option remaining and could not refuse the assignment, the Red Sox sent him to Triple A Pawtucket on Saturday, calling up Jackie Bradley Jr. 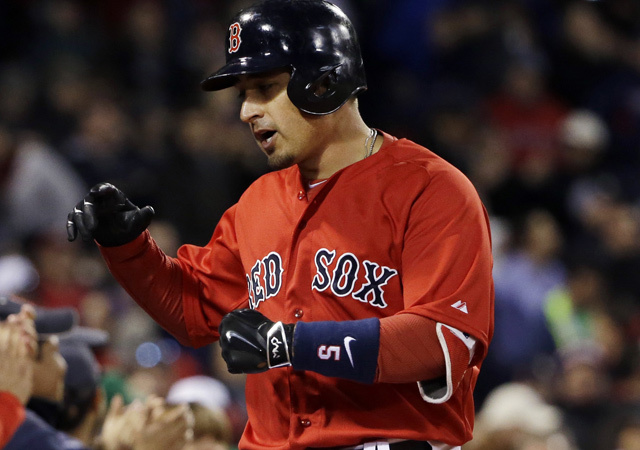 Between Victorino (who should be activated on Monday), Bradley, Craig, Nava and Brock Holt, Boston's rightfielders have hit just .121/.228/.187 in 124 PA this year. Craig is making $5.5 million this year and is owed at least another $21 million beyond, including a buyout of his '18 club option. That money and his long-term record make him difficult for the Sox to release. Still, with $72.5 million man Rusney Castillo also at Pawtucket and trying to get back into shape after missing time this spring with oblique and shoulder woes, the reality is that barring injuries, there just aren't going to be enough at-bats in Boston to go around. A hot streak from Craig could set him up to be traded, though his poor performance means it likely wouldn't bring a return that would have a significant impact on the Sox, who are just 14–17 thus far. 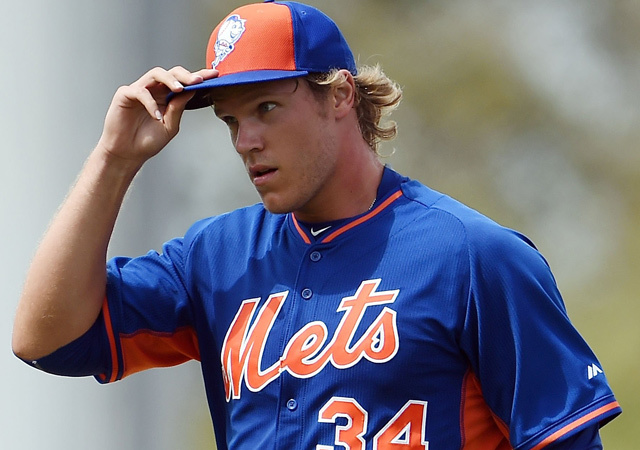 Mets prospect Noah Syndergaard has been on the major league radar ever since he was a key piece in the December 2012 blockbuster trade that sent R.A. Dickey from New York to Toronto. On Tuesday, the Mets will finally take the wraps off the 22-year-old righty. Called up from Triple A Las Vegas to replace the injured Dillon Gee (who hit the DL with a groin injury), Snydergaard will make his major league debut against the Cubs at Wrigley Field. A 2010 supplemental first-round pick who has placed on some of the major prospect lists for four straight years—topping out at No. 9 on Baseball Prospectus' Top 101 Prospects list this year—Syndergard has posted a 1.82 ERA and 4.3 strikeout-to-walk ratio through five starts at Las Vegas this year, a big improvement upon 2014's 4.60 ERA and 3.4 K/BB ratio. Admittedly, some of that owes to a BABIP that's fallen from a sky-high .378 last year to a regression-ready .261, but Syndergaard's new-found maturity may be a factor. Bypassed for a September promotion last year—a situation he called "kind of heart-breaking"—and then taught a lesson in clubhouse politics when veterans spoiled his lunch during spring training, he believes that he's better now that he's handled the adversity that's come his way. When Zack Wheeler was lost for the year due to Tommy John surgery in March, the Mets could have slotted Syndergaard in the rotation behind Bartolo Colon, Matt Harvey, Jacob deGrom and Jon Niese, but they opted to go with Gee, who after two rocky starts to start the year had allowed just four runs in 19 2/3 innings across his last three turns. Even when New York needed a spot starter on April 28, it opted for 24-year-old Rafael Montero due to his previous major league experience. Instead of being sent back down following that turn, Montero is now on the DL due to rotator cuff inflammation. The Mets also could have recalled 23-year-old lefty Steven Matz, another well-regarded prospect who has a 1.70 ERA in Las Vegas, but his 42 1/3 innings there are his first taste of Triple A exposure, and New York general manager Sandy Alderson noted that Syndergaard's last three starts have "really been overpowering." Indeed, he’s allowed just two runs and 11 hits in 22 innings, with a 27/2 K/BB ratio in that span and at least eight strikeouts in each turn. For as highly-regarded as he is, Syndergaard won't have an easy time keeping pace with the rest of the Mets' rotation. Headed by Colon and Harvey, the unit has the league’s best ERA (2.99) and strikeout-to-walk ratio (4.7) and second-best quality start rate (65%). After dropping five out of six at one point last week, the team has won four out of five to climb to 20–11 and enters this week 3 1/2 games up in the NL East.